Note: This interview took place in September 2008, shortly after the launch of Jam with the Band in Japan. 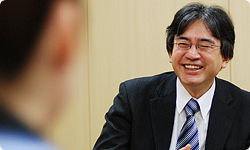 Thank you for joining me for this unusual session of ‘Iwata Asks’. 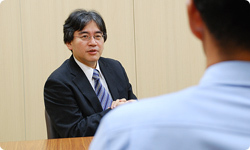 I really wanted to introduce our readers to some post-release reaction to Jam with the Band, so, for the first time, we’re holding a second ‘Iwata Asks’ for a title after it has been released. So, without further ado, please begin, Nishita-san. Of course. 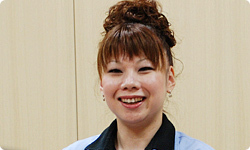 I’m Nishita from Software Development & Design Department at Software Planning & Development Division. For this project, I didn’t work here, where the game was created. In Jam with the Band, users can download up to 100* of their favourite songs, and not only songs prepared by us at Nintendo. One of the characteristics of the game is that music which is written by users and submitted to us can also be selected when it has passed our inspections. My responsibilities involved cooperating with JASRAC1 and Nippon Broadcasting System to ensure smooth management of this system for submitting written music and downloading songs. 1JASRAC (Japanese Society for Rights of Authors, Composers and Publishers) is a body that is entrusted with lyricists’, songwriters’ and musical publishers’ copyrights. It oversees the licensing of music to users, collecting royalties and distributing them to artists. They also play a part in promoting musical culture. 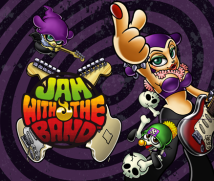 *Note: In the European version of Jam with the Band, the user has 50 pre-installed songs (the Japanese version had 31 pre-installed songs at launch) and can download another 50 songs via Nintendo Wi-Fi Connection. There is also space for an additional 100 songs created by users and saved or traded via Nintendo DS Wireless Communications. Nishita-san, for the first Band Brothers2 game, you did work here on the software’s development as the director. This time, as a producer, your main duties involved coordinating with JASRAC and Nippon Broadcasting System, didn’t they? 2’the first Band Brothers’ refers to Daigasso! Band Brothers, a Nintendo DS launch title that was released in December 2004. It was never released outside Japan. That’s right. For this title, I let Kitamura-san take care of the development of the game itself. Could you tell us a little bit about what happened immediately after Jam with the Band was released? Over the weekend, something rather unexpected occurred, didn’t it? I was at home, keeping an eye on things. If we’d have kept inspecting songs in the same way we had at the beginning, it looked like we were going to fall into a situation where it would take a month or two for a submitted song to be released. Users were submitting songs so enthusiastically, I thought we couldn’t possibly keep them waiting for so long. But writing music takes a lot of effort, and it’s not something anyone can do that easily. We’d assumed that the number of songs we’d have to inspect each day would be no more than 100, and we’d created our systems to deal with that number. However, we received over 1,000 submissions just that weekend. And it didn’t stop there, as they kept coming on the Monday as well. We realised we couldn’t go on like that. We decided to immediately adopt an emergency system until the inspection system was back on track, mobilising large numbers of our Nintendo sound staff to deal with the submissions. Since we’re on the subject, could you give us a simple explanation of the current inspection process, Nishita-san? The process has three steps. The first step is automatically taken care of by computer. Submitted songs that are not registered with JASRAC* or that have the wrong product code* are automatically rejected. *Note: In the European version of Jam with the Band, Nintendo has a copyright agreement with EMI rather than JASRAC and the popular song scores available for download are therefore versions of EMI-copyrighted songs. There are also copyright-free versions of classical scores as well as Nintendo theme tunes available. * The European equivalent of a JASRAC registration number is a “Song Code”. The Song Code for each submission can be found at the official European Nintendo website for Jam with the Band in the “Nintendo Music Database”. Submissions will be automatically rejected if they either have the incorrect Song Code or are based on songs not listed in the Nintendo Music Database. For the next step, we ask for the cooperation of Nippon Broadcasting System in checking the song. There are a lot of songs in the world, so nobody knows every single song that is submitted. That’s why we use Nippon Broadcasting System’s various genre experts to check that the original song is being accurately reproduced. They check the songs by actually listening to them themselves*. *Note: In the European song checking process, the evaluation is completely carried out within Nintendo of Europe in co-operation with external specialists. Nippon Broadcasting System has a really big library of CDs. The experts would look up a song in the CD library, and listen to it alongside the song that was submitted, before deciding: “This one passed” or: “This one failed”. We’d then proceed to the third stage, the internal Nintendo final check. After checking the lyrics for typos and so on, we’d upload the song to our server, and then it would be ready for its first download. Steps two and three require a lot of manpower, so they end up taking a long time, don’t they? That’s right. Furthermore, because an arrangement is required to create songs in Jam with the Band, there was always a lot of back-and-forth with Nippon Broadcasting System, checking whether the song had the right ambience. This confirmation work inevitably took a lot of time. What’s more, some songs were submitted that were not in the CD library. At times like that we bought new CDs, but there were more than a few cases where the CD itself was out of print. Incidentally, Kitamura-san and her team were responsible for the third stage, the final check. We were basically just ‘minions’3 of the people who were submitting the songs. 3’Minions’ was the word that Barbara the Bat (a character in the software) used to refer to her staff in the comic strip that appeared on the website for the first Daigasso! Band Brothers game. Any screams that were heard were screams of joy, I’m sure of it. We kept getting more and more submissions, and although examining each one was hard work, all the submissions we received were of such high quality. What’s more, there were so many songs that had been created with such love for the music. I really wanted to satisfy those who’d submitted the songs, so I was actually glad when the instruction to adopt an emergency system was given. What was the highest number of songs awaiting inspection you had at any one point? It was about 2,500. However, thanks to an increase in the staff at Nippon Broadcasting System and everyone’s hard work, things calmed down in the end. By the way, when you look at the list of songs available for download, you sometimes see that different versions of the same song have been collected and uploaded together. That’s where we prioritised efficiency. Even at the best of times, there were a lot of songs awaiting inspection, so we’d collect the versions of the same song that had been uploaded during the same period and inspect them together. We also received calls from users to collect versions of the same song and release them together. I believe it’s because they wanted to listen to the versions and compare them themselves before deciding on one to download. I see. Incidentally, how are you dealing with new songs? Even after Jam with the Band went on sale, more and more new songs were released, after all. Well, in the case of Ponyo on the Cliff by the Sea, for example, we’d received submissions before the film was even released. *Note: “Ponyo on the Cliff by the Sea” is a very successful Japanese animation film that was released in Japan in 2008 by Studio Ghibli. And as a result, we were able to have the songs ready for download to coincide with the day of the film’s release. So we really got our skates on and speeded up the inspections. But that doesn’t mean that you put other songs to one side in order to prioritise Ponyo, did it? We always stick firmly to the submission order. (flatly) It’s a key policy for us minions. So Barbara’s strict about the submission order as well is she, Kitamura-san?